October 13, 2010 (Alpine) -- Viejas' top chefs will team up with award-winning Ballast Point Brewing & Spirits for a special dinner on Thursday, Oct 14th, 2010 at 6:30 pm in the DreamCatcher Lounge at Viejas. Tickets are $50 each; price includes food, beer and gratuity. A percentage of proceeds will go to the Alpine School District Music & Math Program. September 20, 2010 (Alpine) – The inaugural Viejas Wine Fest, featuring samples from some of southern California’s premier wineries, will be held Saturday, September 25th in the Park at the Viejas Outlet Center in Alpine, east of San Diego. July 9, 2010 (Julian) -- On Friday, July 16, at 7:00 p.m. Jeremy’s on the Hill California Style Bistro will host a four-course wine pairing dinner featuring wines from four back country wineries: Menghini Winery and J. Jenkins Winery from Julian as well as Shadow Mountain Vineyards and La Serenissima Vineyards from Warner Springs. 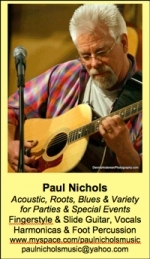 J une 17, 2010 – Paul Nichols will perform his “solo acoustic extravaganza” complete with guitar, vocals, foot stomping and harmonicas on Friday, June 18th from 5:30 to 8:30 p.m. at Gio Bistro & Wine Bar/Restaurant in La Mesa Village. Loyal readers of East County Magazine will recall this talented artist's performances at our “On the Road with the East County” party at The Vines in Alpine and our “Celebrate East County” event at Heritage of the Americas Museum. January 22, 2010 (Julian) -- Owners of a gourmet restaurant, Jeremy's on the Hill, and Shadow Mountain Winery will host a five-course wine pairing and dining event on Wednesday, February 3rd at 6 p.m. All proceeds of the event will benefit Future Farmers of America (FFA) in Julian. The organization raises awareness on the importance of agriculture for past and future generations. 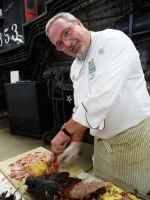 “With lack of funding, we will lose this important educational component of our community,” said Jeremy Manley, 23, Chef de Cuisine at Jeremy's on the Hill “We are hoping you will be able to join us and support your local FFA chapter while enjoying fabulous food and wine from our back country hidden treasures."